This post brought to you by Andre Champagne. 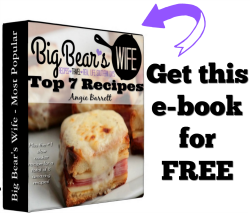 The content and opinions expressed below are that of Big Bear’s Wife. I’m more of a get up at 9 or 10 kinda gal. The kind of girl that would like to wake up a few times, curl back up in a ball of covers surrounded by her two dogs until it’s time for brunch. That’s the kind of girl I am. It just takes me forever to get up when I have to wake up early, even if I’ve gone to bed early. I’m just not built for early dates with the alarm clock. Oh and if it’s dark out, just forget it. I need a lot of light to coax me out of the bed. The apartment that we’re looking at downtown has a huge window in the master bedroom and I’m hoping that it’ll help with my willingness to separate myself from my cozy bed in the mornings. But since I’m not one for early mornings, that means that I’m not up and about for breakfast. However, I’m normally wide awake in time for brunch! What goes hand in hand with brunch? Champagne and Orange Juice. 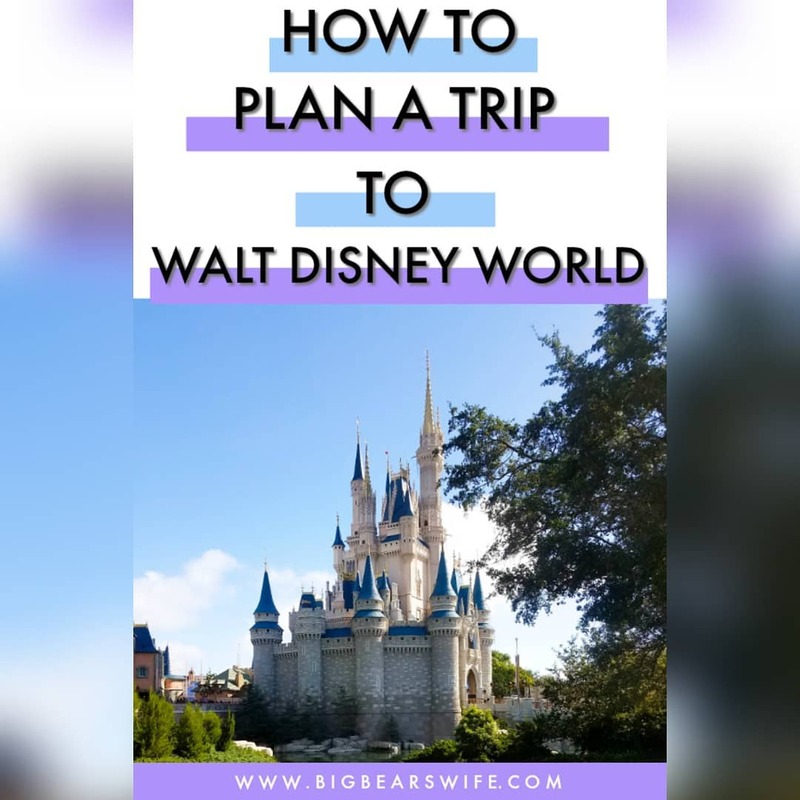 Are you with me on this one? That alone makes me love brunch over all the other meal times! Right now, my perfect brunch includes buckets of fresh fruit, sweet bowls of honey flavored Greek yogurt and Champagne Sangrias. Ready to make your brunch epic? 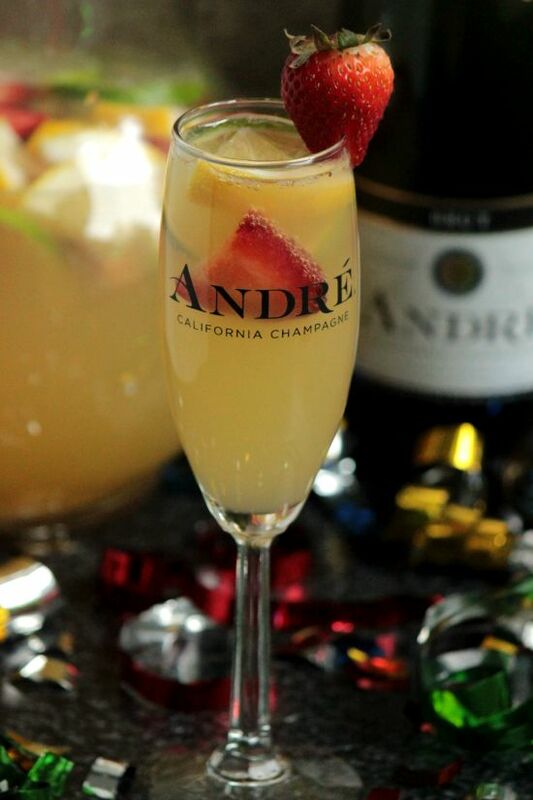 You’re going to need a few bottles of Andre Brut Champagne, a bit of Orange Juice and a few handfuls of fresh fruit. 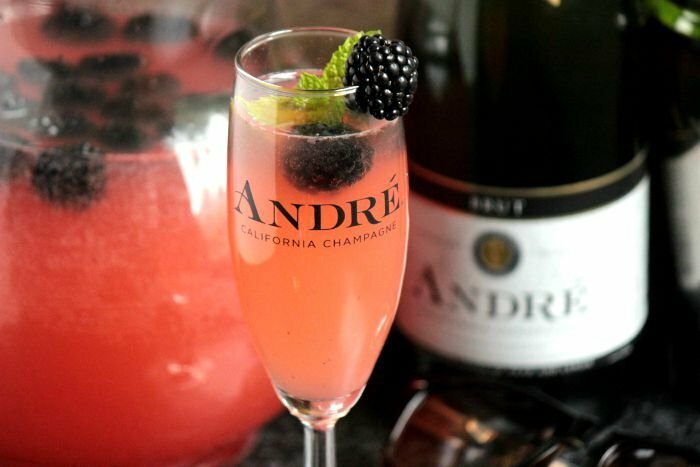 I’m sharing two different Andre Champagne Sangria recipes with y’all today but don’t let these two versions stop you from trying your own fruit flavor combinations! 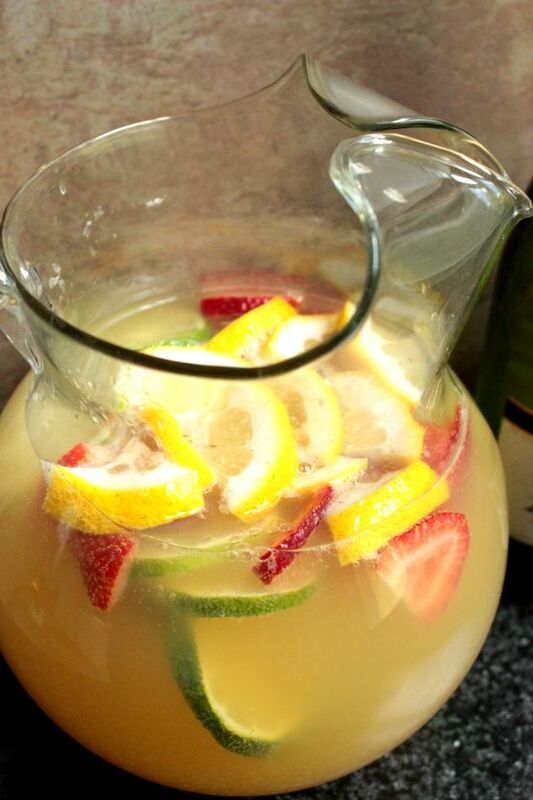 Most everyone has had a mimosa before and those that haven’t are missing out. It’s a sparkly, bubbly cocktail of champagne and orange juice that’s normally served alongside brunch. 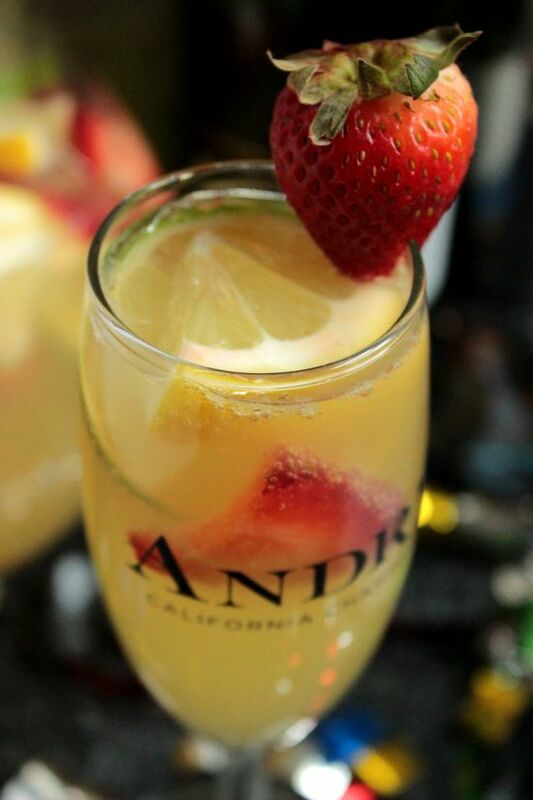 These Champagne Sangrias are pretty close to a mimosa but they’ve also got a simple syrup mixed in along with a few cups of fruit! 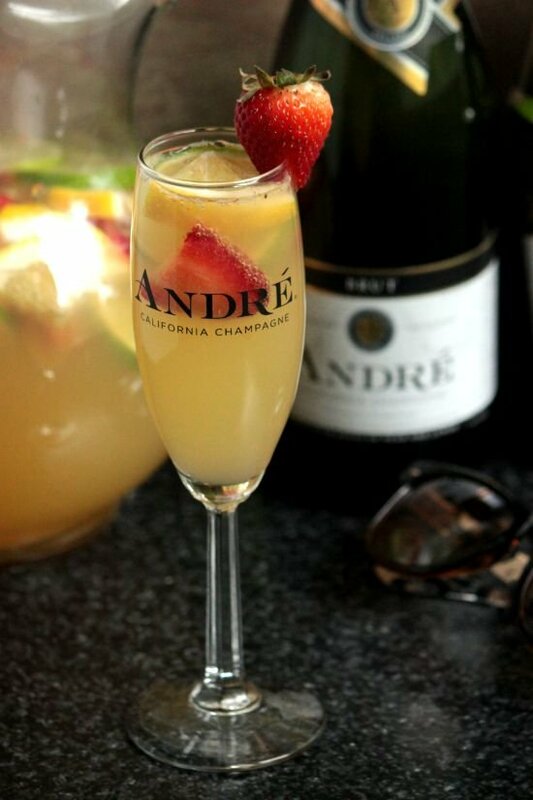 The weekends are my time to relax, recharge, work my tail off on the blog and enjoy brunches with Champagne Sangrias! I may do a lot of my blog work on the weekends but I’m totally ok with enjoying a little brunch time! 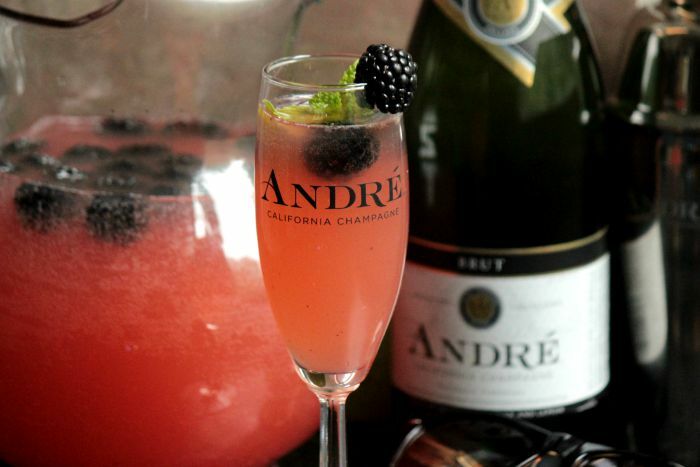 So, like I said, we’re making two Champagne Sangrias today. 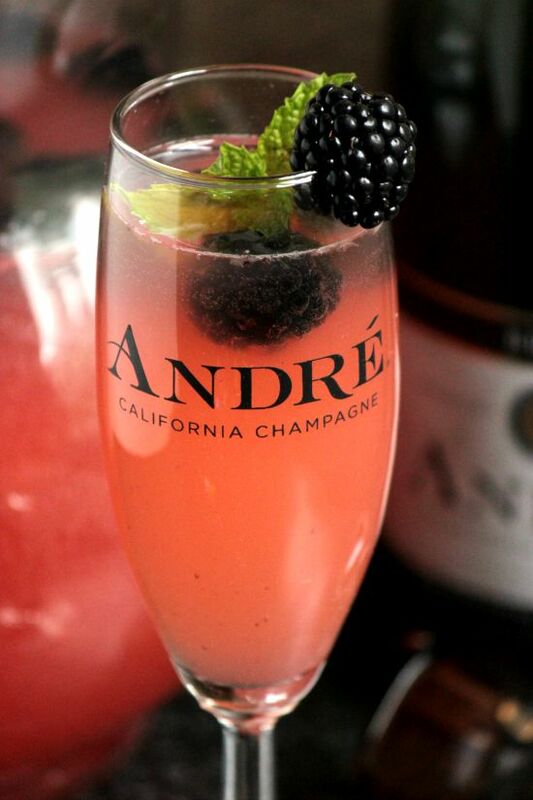 Come on in, slip off your sun glasses and let’s make some Champagne Sangrias for our brunch today. 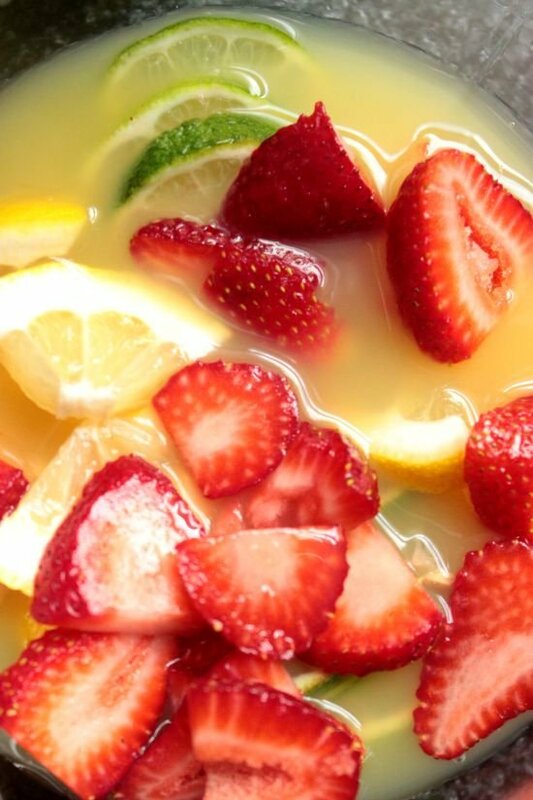 First up we’re putting together a Strawberry Lemon-Lime Champagne Sangria. 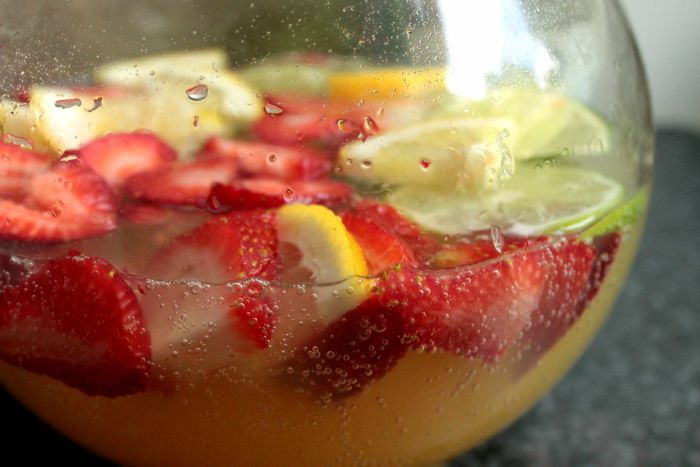 You’re going to want to slice up about 5 fat, juicy, red strawberries and add those to the bottom of a pitcher. Go ahead and toss in a few slices of limes and a few lemon quarters. Now, just add a bit of orange juice and a homemade simple syrup. 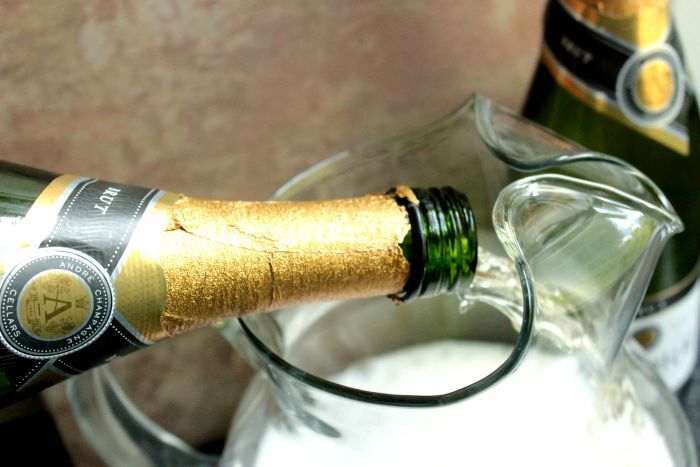 Finally, it’s time to add the champagne. You’ll need to pour in 2 bottles. 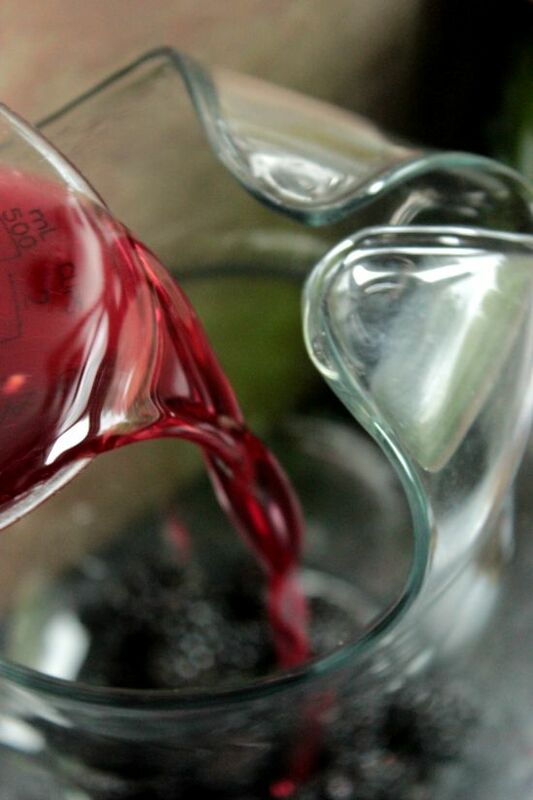 DirectionsCreate a simple syrup by combining the sugar and water in a small sauce pan. Simmer over low heat until sugar melts, whisking occasionally. Remove from heat and let cool for about 15 minutes. 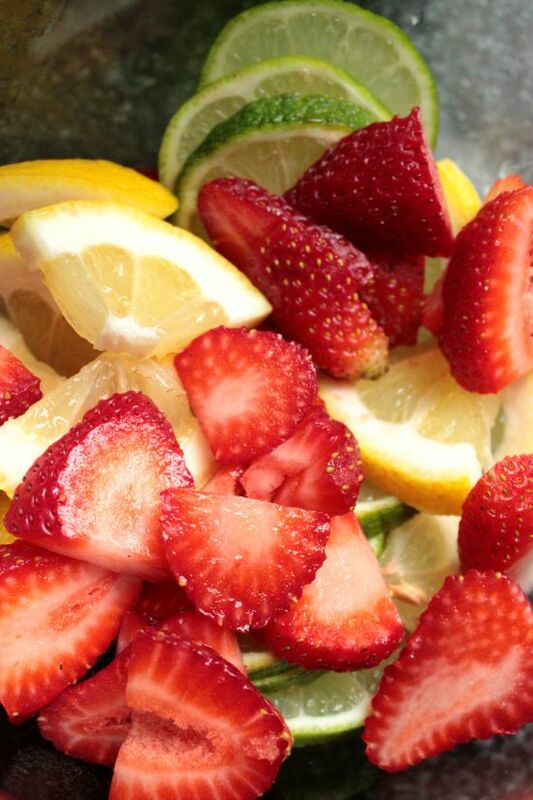 In a large pitcher, combine the strawberries, lime slices and lemon slices. Add in the orange juice. Stir in the simple syrup. 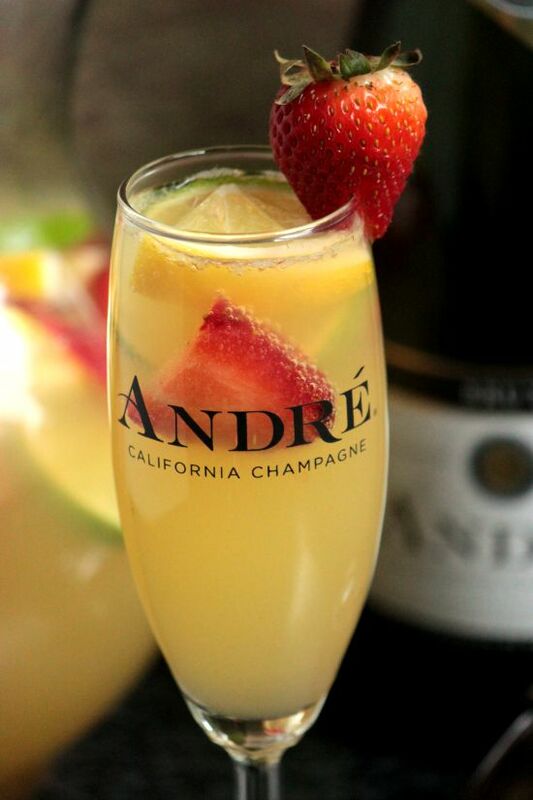 Pour in the two bottles of Andre Champagne. Stir. Chill until ready to serve. Second, we’re making a Blackberry Mint Champagne Sangria. 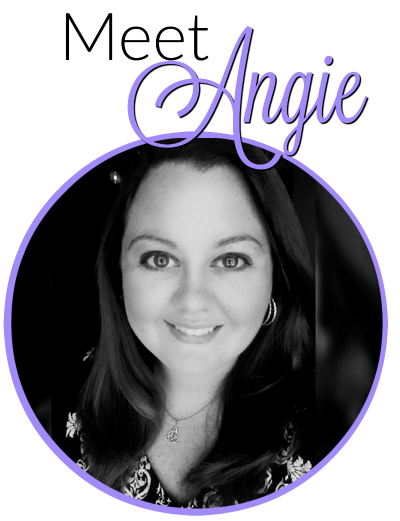 An easy mint and blackberry simple syrup is mixed with a few fresh blackberries in the bottom of a pitcher with a bit of orange juice to create the base for this Champagne Sangria. 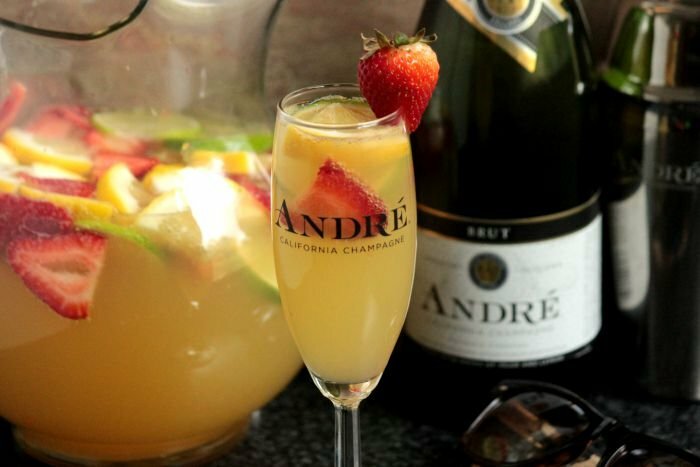 Fill the pitcher with two bottles of Andre Champagne and you’re all done! 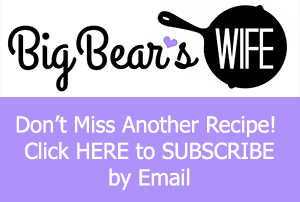 Create a blackberry mint simple syrup by combining the sugar, water, mint and 6 oz of blackberries in a small sauce pan. 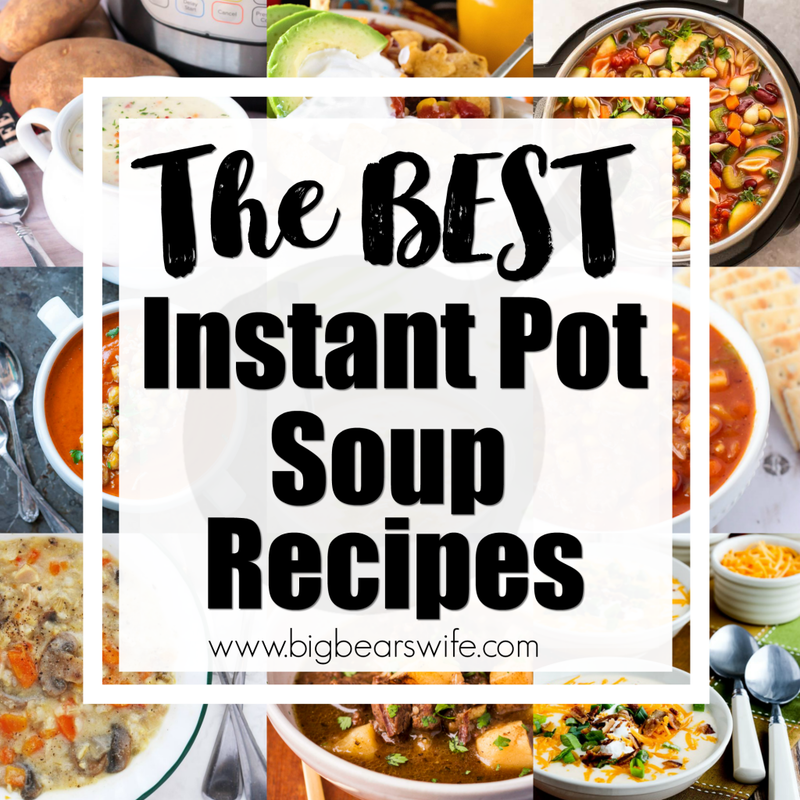 Simmer over low heat until sugar melts, whisking occasionally. Simmer for about 15 minutes. Remove from heat and let cool for about 15 minutes. 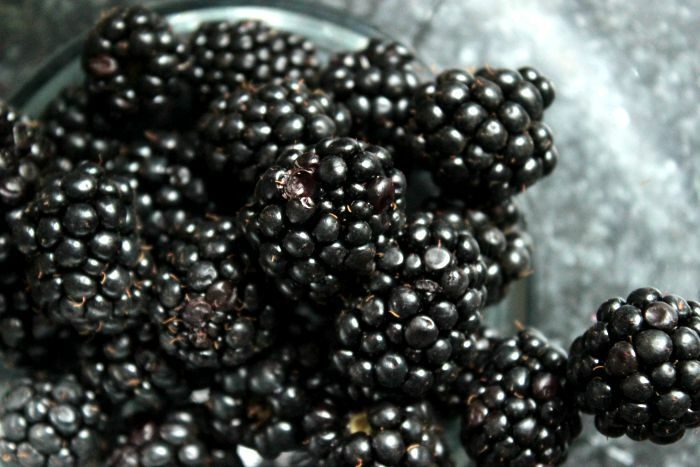 Strain and discard the blackberries, seeds and mint leaves.Add the second set of blackberries to a large pitcher. 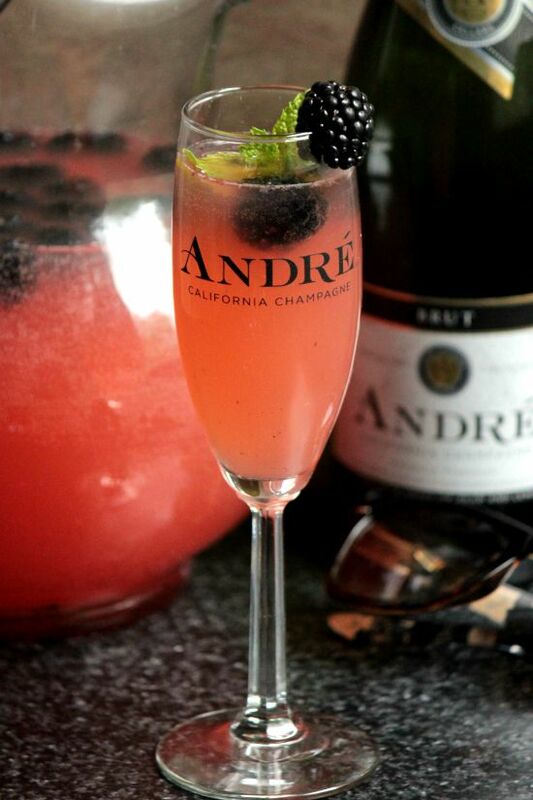 Pour in the two bottles of Andre Champagne. Stir. 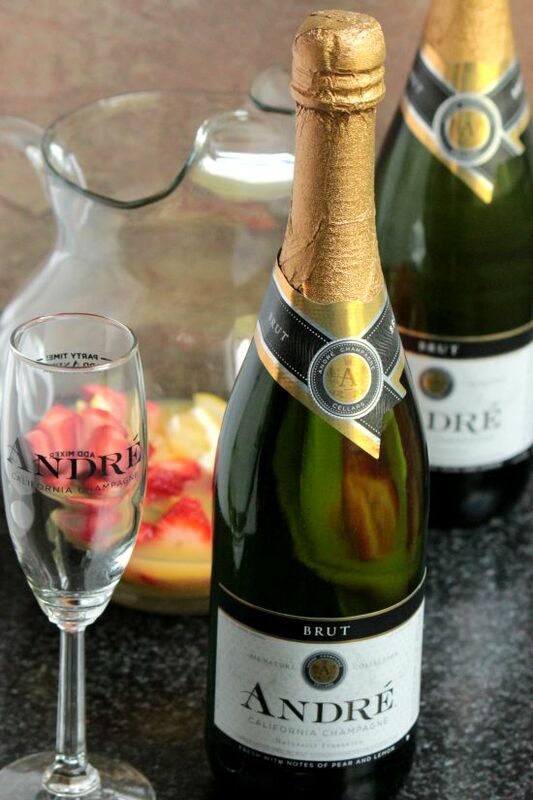 Chill until ready to serve. .
How has Andre taken your ordinary get together to, extraordinary EPIC bash? 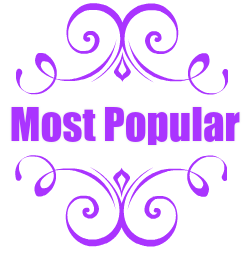 Share your EPIC stories here!